When Dad first got sick, Connor and I started to fight a lot but not because he was doing anything wrong. It was because I was mad at Dad for being sick. Now I feel sad a lot. But learning all about feelings is one of the things that has given Connor and me new Super Powers. Feelings change all the time and now we know there are things we can do to get us through the tough times. Do you ever have ants in your pants and you can’t sit still? Maybe you feel jumpy and get mad a lot. Maybe you cry more often than you used to or get in trouble more. As things at home change, you may have lots of new or different feelings. You are not alone. When someone you love is sick, you will experience lots of different feelings. It can be tricky to know WHAT you are feeling or WHY. Feelings might show on your face, like when you have a big smile because you feel happy. Feelings also show in your body, like when it feels like butterflies are in your stomach when you are nervous or like when your face gets red because you feel embarrassed. All kinds of feelings are normal. You may find that now that someone you love sick with FTD, your feelings feel “bigger” than they used to. It’s important to know that these feelings won’t last forever and that there are things you can do to help you feel better. Learning about FTD and about the feelings that go along with it can help you do and feel your best. Click in the boxes below to find out more! 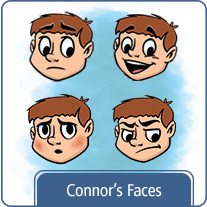 “Connor’s Faces” is a chart that shows you what different feelings look like and when someone might feel that way. 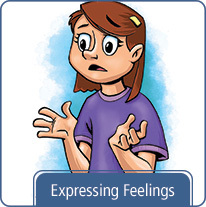 “Expressing Feelings” provides tips for things you can do to help handle feelings. 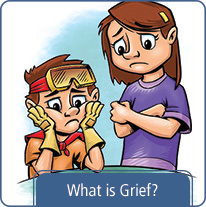 “What is Grief?” talks about the feelings of loss that can be an especially difficult part of FTD. 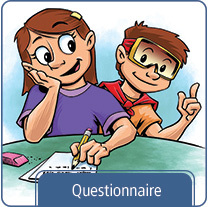 “Questionnaire” is one way Sophie started talking to family members about how they feel having a loved one with FTD. You can print the questions and try it with your family too. 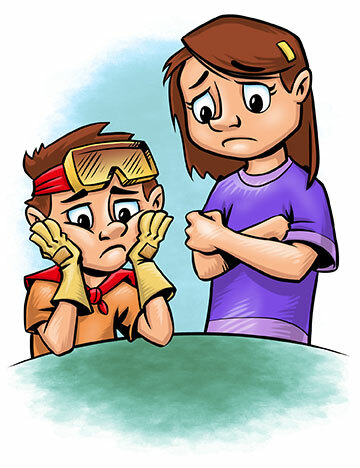 Remember, lots of other kids have a parent who is sick. When you are lonely, sad or hurting, sharing your feelings can give you Super Strength – just like Sophie and Connor. To see some of the things other kids have written or drawn to express how they feel about FTD and how they handle it, visit the sections in Kids Like Me. If you would like to share your thoughts and feelings with other kids, you can! Just click Contribute to the Website.